I am trying out PhpStorm now and hopefully someone can help me with a question, please. I figured out how to reposition the Applied Styles window along the right side of the interface in PhpStorm, however it's not letting me interact with it - am I doing something wrong? In Dreamweaver, you could double-click on something in the styles panel, anywhere, on any value etc. and make changes in the panel and that was super handy; without having to change tabs to the other file. Now, in PhpStorm it seems the only way to edit CSS properties is to actually switch the entire view to the tab of the .css file and do the manual edits there. I don't prefer having to switch my document tabs back and forth to edit CSS and back to HTML page - any idea how I can modify this at all? Is there any way to setup PhpStorm in the manner I am asking and be able to edit styles directly in the Applies Styles window? Also, have the Applied Styles window auto-update as I click around the HTML code above, so I don't have to keep right clicking on tags/code and selecting Applied Styles each time. 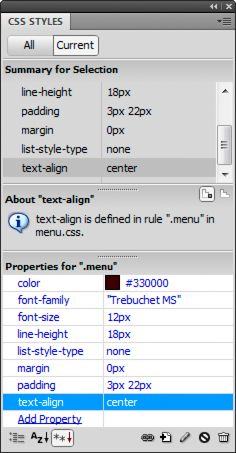 There is no way to edit css directly in CSS styles tool window - you have to click 'navigate to style sources' in source preview and edit css there.